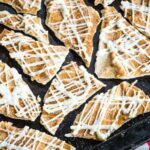 Snickerdoodle Hot Chocolate White Chocolate Bark has a layer of creamy white chocolate swirled with a cinnamon caramel sauce and sprinkled with cinnamon sugar. Inspired by the seasonal Starbucks snickerdoodle hot cocoa and the classic Christmas cookie with the same name, this easy chocolate candy is the perfect holiday treat. 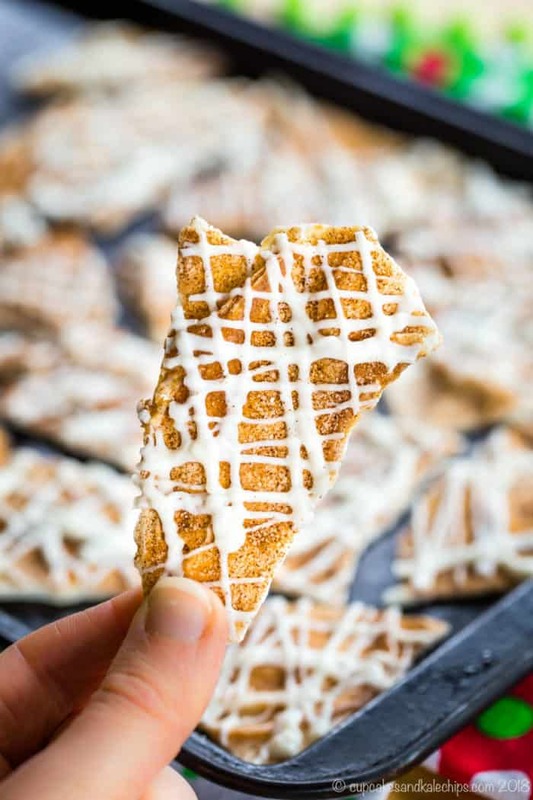 And if you can’t enjoy the traditional cookie made with flour, you can always nibble on snickerdoodle white chocolate bark as one of the best gluten free no bake dessert recipes! It’s December. Almost Christmas. And my hubby has to be in England for a week. This totally made me a sad mama, but we are getting through it. In fact, the first day he was gone was true Christmas season perfection. I woke up early without an alarm and before the boys to start the day with some peace and quiet. We went to First Sunday of Advent mass. When we came home we got back in our Christmas jammies, turned on some Charlie Brown Christmas soundtrack, and decorate the tree. We watched lots of Food Network holiday baking competition shows and set up the village. The kids got an afternoon treat of hot chocolate with candy canes. I may or may not have told them that it was against the law to hang ornaments incorrectly. And despite that, there was only one mommy meltdown when after all their hard work they wouldn’t let me take a decent picture. I’m calling it a Christmas win! We just missed daddy and his train set. But once he is back, game is on for all of our final Christmas preparations. That means I need some easy treats to make! This easy candy is like a cross between the white hot cocoa from everyone’s favorite coffee shop and the classic Snickerdoodle Cookies. This chocolate bark has the creamy, rich vanilla flavor of the hot cocoa with a hint of buttery goodness like the cookie. Then it has the coating of cinnamon sugar that is the hallmark of snickerdoodles. An extra drizzle of more white chocolate is reminiscent of the whipped cream on top of your mug. What is in a Starbucks Snickerdoodle Hot Chocolate? Milk and white chocolate mocha sauce are steams to make that velvety white hot chocolate. Cinnamon Dolce Syrup is mixed in to give it that flavor of warm spices. Then it is topped with whipped cream and cinnamon sugar to make it taste like drinking a cookis. 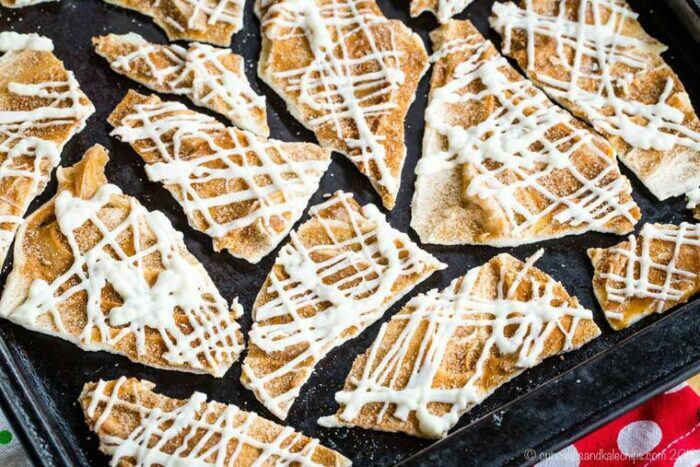 So then what is in Snickerdoodle White Chocolate Bark? 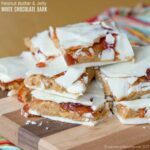 White chocolate almond bark or melting wafers – you can use white chocolate chips, but they don’t quite melt as smoothly. This is the base just like the white hot chocolate. 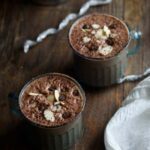 Butter extract and vanilla extract – these flavorings give it the creamy flavor of the hot chocolate with the little taste of cookie goodness. Salted caramel mixed with cinnamon – this takes the place of the Cinnamon Dolce Syrup, which would be too watery to swirl into the bark. 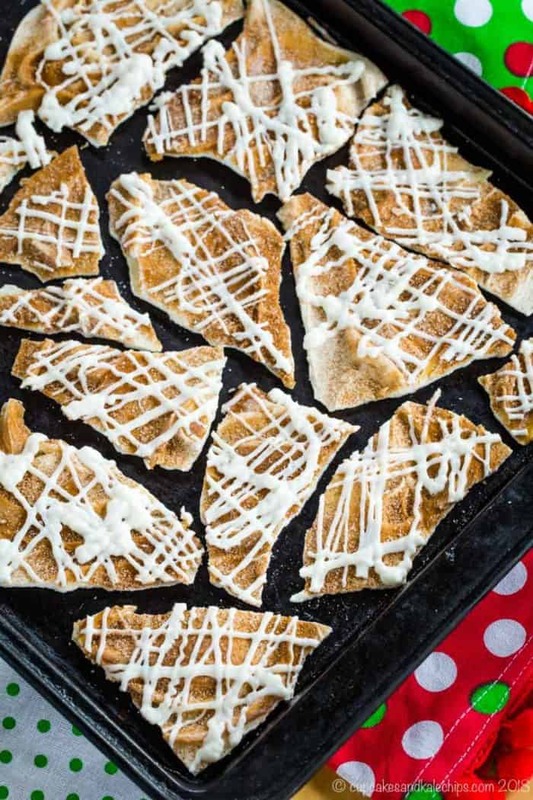 So, how do you make Snickerdoodle Hot Chocolate White Chocolate Bark? 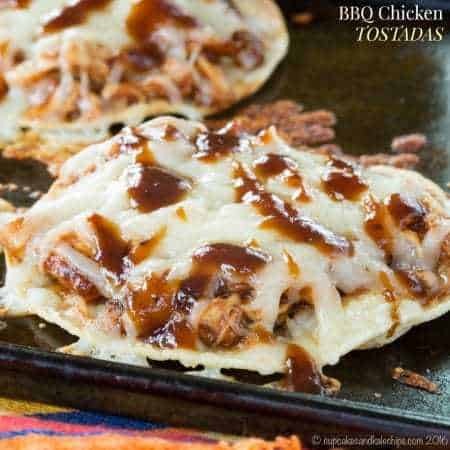 Cover a sheet pan with wax paper or a silicone baking mat. Start by melting your white chocolate in the microwave or in a double boiler. Quickly stir in the vanilla and butter extract, then spread it into a think layer on your prepared baking sheet. Slightly warm the caramel sauce and stir in a bit of cinnamon. Then drizzle over the white chocolate base and swirl in with the tip of a butter knife or small metal icing spatula. Combine cinnamon and sugar and sprinkle over the entire surface. Finally give it one last drizzle of a little more white chocolate to make it look gorgeous. 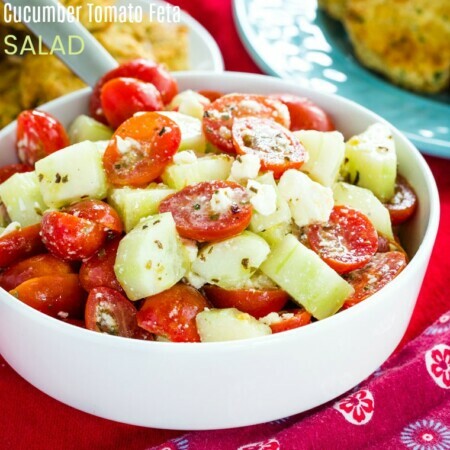 Cool, popping into the refrigerator if needed, and break into pieces. For melting the chocolate, just follow the directions on your package. 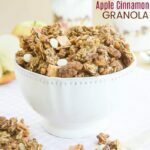 The large cubes of almond bark or candy coating will have different microwave instructions than the melting wafers as far as time and power level. You can use white chocolate chips, but they often do no melt and spread as smoothly, and when it cools you might not get that same shiny finish. Use a good quality vanilla extract or the chocolate will seize up. Even with god vanilla, when you add it, the white chocolate will thicken up. It will still be spreadable, but not completely pourable as it was before you added the extract. Do not try to remelt it. You will burn the chocolate. 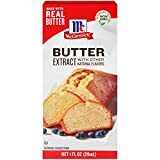 If you can’t find butter extract, you can add a half tablespoon of butter. 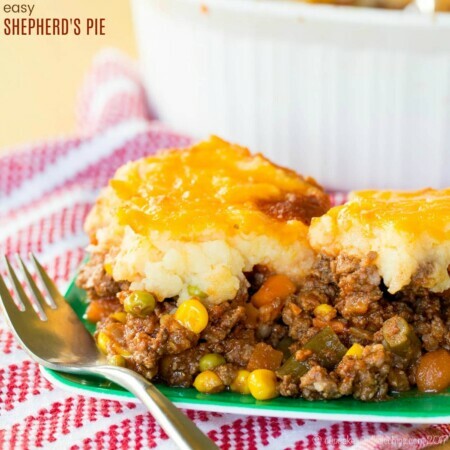 The extract gives the nice buttery flavor without affecting the texture of the final cooled product. Is chocolate bark gluten free? Yes, unlike traditional Snickerdoodles, this chocolate bark is gluten free. 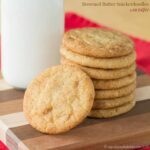 So it is the perfect way to enjoy your favorite cookie flavor without baking. Do be sure to verify your chocolate and extracts are gluten free, as some products may be affected by cross-contamination or have gluten-containing additives. What do you give to someone who loves Starbucks? I definitely recommend making them a package of Starbucks Inspired Chocolate Bark to go along with a gift card or a Starbucks mug. 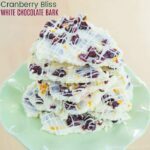 Cranberry Bliss White Chocolate Bark tastes just like the topping on those seasonal bars everyone loves. 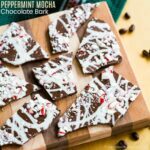 Peppermint Mocha Chocolate Bark has the festive flavors of the favorite holiday drink. 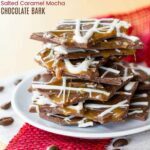 And Salted Caramel Mocha Chocolate Bark is rich and sweet and salty and indulgent, like its namesake drink. Chocolate bark is one of the best holiday treats to make for Christmas. 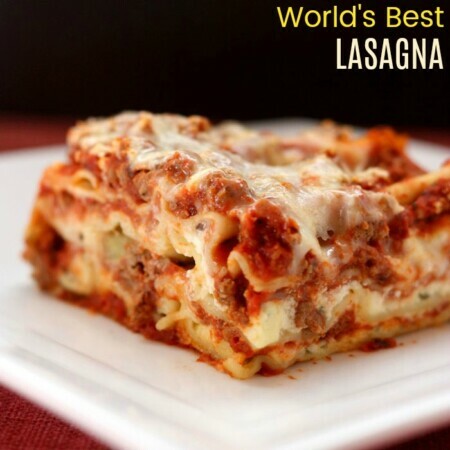 It has only a few ingredients, you can make it in minutes, and it looks so pretty. 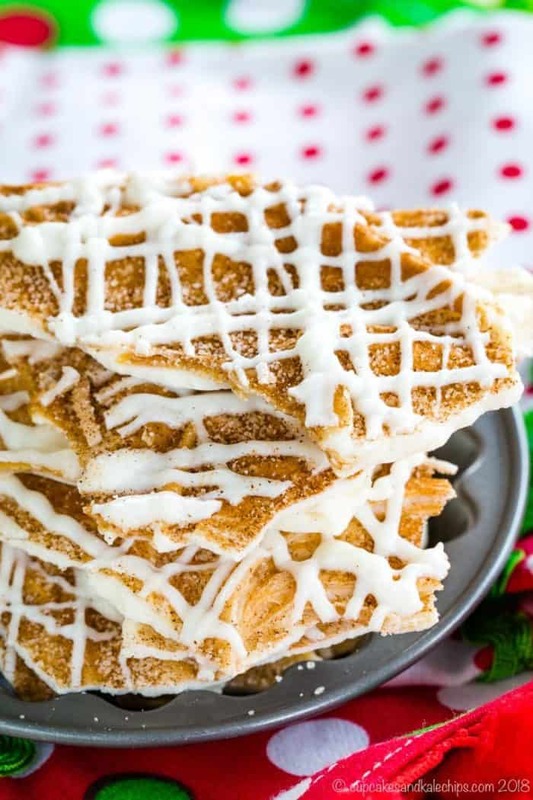 This cinnamon sugar white chocolate bark inspired by the Starbucks Snickerdoodle Hot Chocolate is no exception. 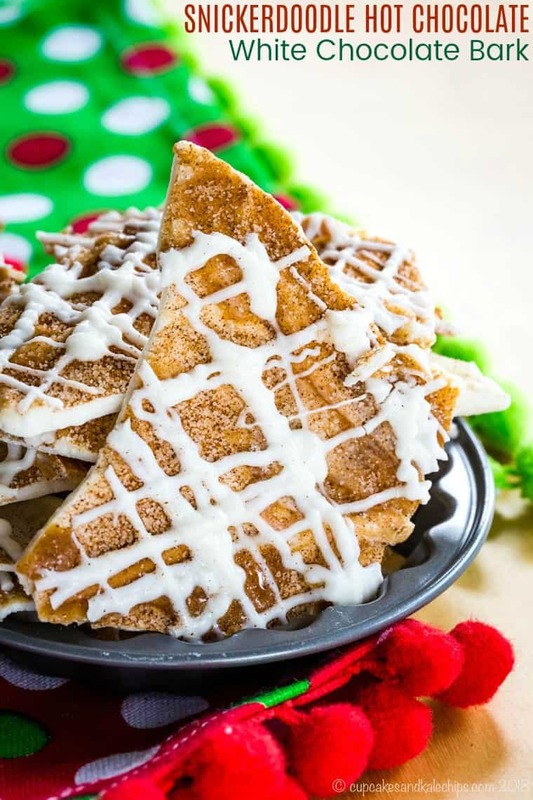 Cream white chocolate, swirls of cinnamon caramel, a cinnamon sugar topping, and one last drizzle of more white chocolate make it look and taste so festive.